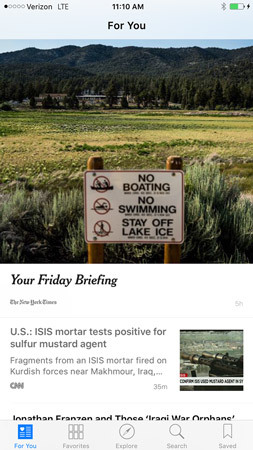 With iOS 9 comes the News app. This so-called news aggregator gathers news stories that either match your news reading habits or match the channels and topics you’ve selected. You can choose which news sites are your favorites, search for news on a particular topic, and save news stories to read later. To get started with the News app, tap the app to open it. The first time you open it you will be asked a few questions to set up the app, choosing your favorite news sources and whether to deliver news to your inbox, for example. The For You tab of news stories appears by default, though whichever tab you last chose will appear next time you open the app. Scroll down the page to see the news stories of the day. 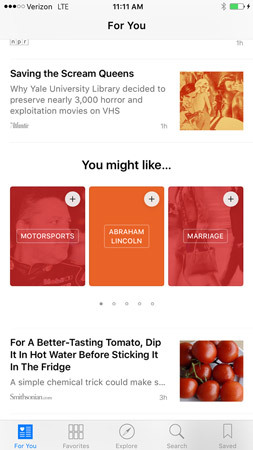 Tap an item in the You Might Like list for more items that might be of interest to you. When you’re reading a story you like, you can tap the Share button at the bottom of the screen to share via Mail, Message, Twitter, or Facebook.